Microsoft has released Security Compliance Management Toolkit. It aims to help provide IT Professionals with an end-to-end solution to help organizations plan, deploy and monitor security baselines of Windows Operating Systems and Office 2007 applications. We have received quite a number of reports of Conficker worm making its round in Malaysia. Please note that this is not isolated to Malaysia, but is wide spread through the world. If you have been updating your machines and keeping them up to date, good on you. Almost all Anti-Virus Vendor are having a tough time dealing with it. Below are some information that will help identify, fix and resolve. Do note that detection and cleaning of the worm is already taken into account with the latest ForeFront signature. Good News for ISA Users- There are scripts available publically from http://www.isatools.org/tools.asp?Context=ISA2006, http://www.isatools.org/tools.asp?Context=ISA2004 à “block conficker.vbs” which will block the worm at perimeter level itself. Please proactively monitor your environment. This may potentially be damaging on a scale similar to Blaster. Staying up to date and taking steps to prevent is the best form of defense. Apparently, Google Chrome has a unique ID which can lead to an individual being identified. Interesting. How can you use something like a browser that can lead you to being identified. Anyways, someone made “unchrome”. For Mac lovers who thought they’re very safe on a secure platform, think again. I don’t wish to hit out at Mac that its unsecure, but i do want to bring out that Mac also needs protection. The OS itself needs protection. In fact, any operating system needs additional protection. Windows covers almost 90% of the computers out that, making it a super hot target. However, think again, because its a hot target, most attackers would have hit it relatively hard. 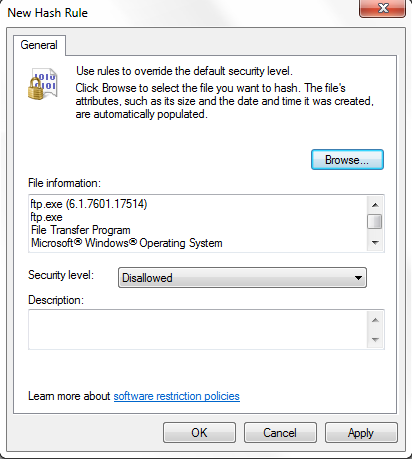 In Microsoft, there are many initiatives and efforts to make sure Windows Operating Systems remain secure. Anyway, here’s the iMac article a fellow Windows group pal brought up. The Microsoft Security Assessment Tool employs a holistic approach to measuring your security posture by covering topics across people, process, and technology. This revised version features an updated defense-in-depth assessment plus questions related to the evolving threat landscape. Findings are coupled with prescriptive guidance and recommended mitigation efforts, including links to more information for additional industry guidance. The IT Compliance Management Guide can help you shift your governance, risk, and compliance (GRC) efforts from people to technology. Use its configuration guidance to help efficiently address your organization’s GRC objectives. The Encrypting File System (EFS) Assistant is a software tool you can use to centrally control EFS settings on your mobile or desktop PCs. The EFS Assistant can help you encrypt the sensitive files on your users’ laptops, regardless of where those files are located. Part of the Data Encryption Toolkit for Mobile PCs, a community version of the tool, is also available from CodePlex at www.codeplex.com/EFSAssistant. Windows Server 2008 featuring Internet Information Services 7.0 (IIS 7.0) is a powerful Web application and services platform that delivers rich Web-based experiences. Learn how to install and configure security settings for IIS 7.0, including built-in user and group accounts, URL authorization, SSL, and request filtering. Part of the patterns and practices guide for "Improving Web Application Security," this checklist is designed to help developers build and secure Web services by outlining design, development, and administrative considerations. Get best practices for securing your servers, using the Security Configuration Wizard, and assigning administrative roles.